As a Google Analytics Certified Partner and Google Tag Manager Specialist, MoreVisibility is deeply involved in the field of Analytics. From getting started with your web analytics software to training your staff to use your analytics tools more effectively, MoreVisibility can help. 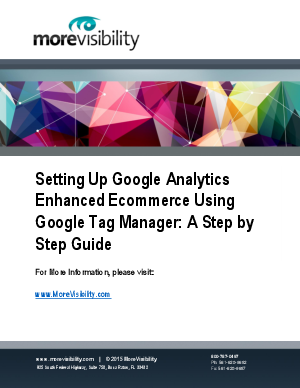 This guide covers a step-by-step outline to help you deploy Google Analytics Enhanced Ecommerce via Google Tag Manager.